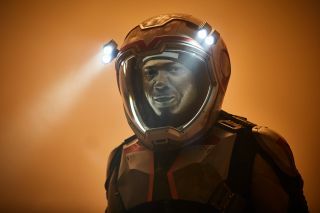 In National Geographic's "Mars" series, engineer and roboticist Robert Foucault (played by Sammi Rotibi) goes out into a Martian dust storm to repair the crew's power supply. In the fifth episode of National Geographic's "Mars" miniseries, the Mars colonists' mental stamina is put to the test as the crew works through some seriously stressful situations. The series, which airs Monday nights on the National Geographic Channel, combines scripted scenes depicting the lives of the first human settlers on Mars with real interview footage featuring some of the leading space exploration experts of our time. While the fictional pioneers struggle to cope with the tumultuous Martian environment and feelings of isolation and helplessness, experts like NASA scientist Jim Green and Andy Weir, author of "The Martian," chime in to provide context and explain what the settlers are going through. John Light as Dr. Paul Richardson, the British exobotanist, left, and Jihae as Hana Seung, the Korean-American mission pilot and software engineer. To successfully colonize the Red Planet, one of the most important things that Mars settlers will need is mental resilience. Feelings of isolation can take a toll on a person's mental health. Top that off with the stress of living on a strange, lifeless and deadly planet, and you have a recipe for potentially huge problems. Even one emotionally unstable person in a Mars habitat could put the lives of everyone in the colony at risk, as we'll see in tonight's new episode of "Mars," titled "Darkest Days." An epic Martian dust storm plagues the crew's colony at Olympus Town, keeping the crew cooped up inside their enclosed habitat for months. The storm is so severe that the crew needs to suspend outdoor activities — even critical missions to make repairs to their outdoor electrical infrastructure and power supply. Meanwhile, a thick coat of dust accumulates on the solar panels, hampering their solar energy production. As the entire colony begins to run out of power, and with no end to the dust storm in sight, the crewmembers must make a real effort to keep their cool. An artist’s illustration to a huge dust storm on Mars. Dust storms will pose several problems for future colonists on Mars, including poor visibility, damaged machinery and unusable solar panels. Today's Mars rovers have already experienced some of these hardships while weathering Martian dust storms. Such storms can be so enormous that the entire planet can be coated in the dusty clouds. Much like Earth's storms, lightning can also occur on Mars. For any people living in a Mars habitat during such a storm, that means being stuck inside a bubble with your fellow colonists for months. To test the psychological effects of being separated from all but a few other human beings, teams working on mock Mars missions like the Space Exploration Analog and Simulation (HI-SEAS) have built habitats that are designed for Mars, and they have placed them in remote places on Earth. HI-SEAS put a crew of six people in these habitats for a year to test their emotional endurance. While the crewmembers said that they were extremely happy at the end of the mission, the year that they spent together in isolation was not entirely free of conflict. While such simulations provide insight into the psychological troubles colonists might experience when living on Mars, they still take place on a nice, hospitable planet Earth. The Martian environment would only compound the psychological struggles that are bred from living in isolation. See how the Mars colonists hold up in a tremendously stressful (and dusty) situation tonight (Dec. 12) at 9 p.m. on the National Geographic Channel. Note: The National Geographic Channel announced today that Episode 5 of "Mars" has been dedicated to the legendary NASA astronaut John Glenn as a tribute. Glenn, who died on Thursday (Dec. 8) at 95, was the first American astronaut to orbit Earth and a former U.S. senator. A short audio clip from Glenn's historic orbital flight will play at the beginning of tonight's episode.